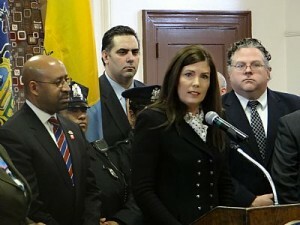 Press release: Pennsylvania Attorney General Kathleen G. Kane today closed the “Florida Gun Loophole” that previously gave Pennsylvanians – who were not also Florida residents and who were either denied, found ineligible or had gun permits revoked – the ability to obtain a Concealed Carry Permit from the state of Florida. According to philly.com: The loophole allowed about 900 city residents to carry a weapon in Philadelphia if they had a mail-order permit issued by Florida. “This loophole has effectively undermined Pennsylvania law concerning the issuance of concealed carry permits,” according to a press release from Philadelphia District Attorney Seth Williams. Gun owners who currently have a Florida permit have 120 days to obtain a new one from Pa., according to politicspa.com. Florida residents or citizens with dual residency are not affected. According to citypaper.net: About 4,000 Pennsylvanians have concealed-carry gun permits from Florida, a loophole that’s been a major and intractable issue for gun-law-reform advocates. ABC27.com is reporting: Pennsylvania currently recognizes valid firearm licenses or permits from 18 other states. In turn, these state recognize valid Pennsylvania licenses.